We want you to be completely satisfied with our products and services and to be rewarded by each investment you make with us. 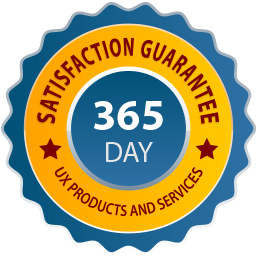 Your satisfaction is ensured with our 365 day money back guarantee. Our usability seminars, usability labs and usability consulting services are absolutely guaranteed. If you are not completely happy with a product or service you purchase, you have the privilege of qualifying for a full refund, credit or replacement of the initial amount for a period of 365 days after the date of purchase. It is important to us that we do the job to the highest standards of professionalism and deliver to your expectations. We stay abreast of new developments and research in the field of usability and want you to completely benefit from our expertise and recommendations. We are motivated by accountability and excellence. We feel this is particularly important in a business climate where many clients are reporting being "burned" by poor usability consultants. Our work is about customer advocacy and that includes advocating for our clients best interests. We promise to make it right for you.